Labor Day Special running now through 9/9th! $100 prepaid plan for $150 in service. Purchase via Paypal link below or stop in our Stores. As we enter June, we would like to take note, on how fast 2018 has been going. A few months ago our pipes burst from record freezing….and now it’s way too hot to be in the dry cleaning business. As we journey to the 2nd Half of the year we are offering a 50% off Prepaid Special starting Monday, June 4th through Sunday, June 17th. Purchase a Prepaid Plan for $100 and Receive $200 in Store Credit. Everyone likes to save money when they can. At SIIDC here are some simple ways to save on your Fabric Care bills. 2018 has kept things exciting. During our vacation into the New Year we had several pipes burst and/or crack, along with equipment failure. Everything is back up and running, thankfully! I’m sure we were not the only ones to experience a surprise repair expense right after the Holidays, so we would like to offer a savings to you. The Deep Freeze Special is $250 for $500 worth of Service. It runs now til Sat. Jan. 13, 2018! Purchase in store (Homewood or Downtown) or click on the PayPal link below and let us know which location you would like your credit at. Now until Sat. 9/9/2017 you can purchase a $100 prepaid plan and receive $150 in service! Stop by our Homewood or Downtown Store….or purchase online here via paypal. Purchase a $100 Prepaid Plan and receive $150 in fabric care service. Good for Downtown x Homewood x Valet Customers. When dropping off items to the cleaners, please point out any defective areas. During the month of November 2016, receive $5 off your dry cleaning and/or shirt laundry order, when you share your Top 5 Musical Artists of all time! That’s right. Just tell our counter rep who your favs are, and get $5 off your order. Order must be a minimum of $20 (before discount) and paid in advance (can not be combined with other discounts). *one discount per customer. 2016 is coming to an end. For the final months, SIIDC has 3 great ways to save! Donate a coat, share your favorite musical artists with us, and plan ahead. Labor Day is over and that means that Summer is coming to an end. 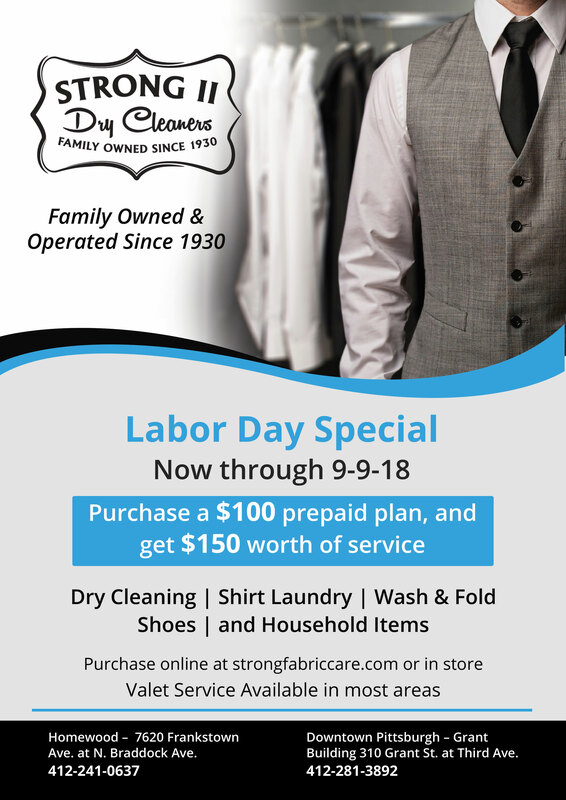 Strong II Dry Cleaners is offering a Savings Opportunity as we say Bye Bye to Summer.